If you require Cedar City insulation services, Eco Insulation provides everything you need. Not only are our products and services ideal for insulation, they go above and beyond to save you energy (and therefore money) in the long term. Our products are also environmentally friendly. When you choose our services, you can rest assured you are getting the maximum degree of both energy saving potential and personal comfort through Eco friendly products. The results of low quality insulation materials and improper insulation services can take a serious toll on your bank account. As a BPI Certified company, Eco Insulation can perform a full energy audit on your home to show you exactly where energy is being lost in your home, and how much. After we’ve completed our services, we can perform a follow-up audit to make sure we’ve met our goal of bringing your home up to its maximum energy saving potential. Air Sealing: By caulking and weather-stripping your home, we will ensure that there are no areas through which air can escape. Attic Ventilation: This involves the installation of baffles in your attic. Baffles will prevent attic insulation from blocking air flow. This also helps prevent moisture from accumulating, which can result in mold and rot. Duct Sealing: About 20 to 30 percent of air is lost from faulty duct systems, according to the EPA. Cool and warm air tends to escape from cracks, holes, leaks, and other damaged areas, the end result being a home that isn’t as cool as it could be during the summer, nor as warm as it could be in the winter. This drives up energy bills, as well as diminishing the comfort level potential of your home. Eco Insulation will make sure that all areas in your duct system where air could escape are properly sealed off. This includes areas such as folded edges, supply lines, joints, registers, and returns. 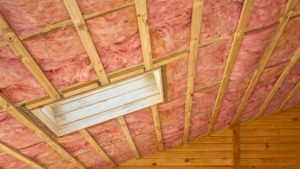 Fiberglass Insulation: The right kind of insulation will not only keep your home warmer during the winter, it will also keep your home cooler during the summer. Our fiberglass insulation in Cedar City will bring your home up to its maximum energy saving potential year-round, as well as save non-renewable resources, reduce greenhouse emissions, and prevent condensation from building up on the walls and ceiling. Of course, high quality insulation also improves the health and productivity of those living in the home. Our Cedar City insulation services come with a Customer Satisfaction Guarantee. We also provide a Lifetime Guarantee Against Insulation Settling. This means that if our work is not 100% to your expectations or satisfaction, we will correct the problem for you at no extra cost. Don’t settle for subpar insulation products and services. When you choose Eco Insulation, you will have peace of mind knowing you have maximized your home’s energy saving potential year round. Our services will save you money, improve your home’s comfort level, and enhance your quality of life. Eco Insulation is an independent contractor and not employed by any utility company. Eco Insulation acts as informants of the available rebate and incentive programs in each location to help further the goal of energy conservation.